I accidentally know about your gallery... I'm very interested in your caricatures. I would like to order a caricature in colour marker with theme - with background & body for myself and my fiance that will be used for our wedding, and want to draw with our favorite motor as a background... so I'd like to attach our photos in this email to let you have a look. Could you let me know how long does it take for a caricature to be finished and how does it cost? ........About our ideas in the picture, as said before I want the groom in suit and red tie, the bride in white gown, long white veil and pink bouquet. 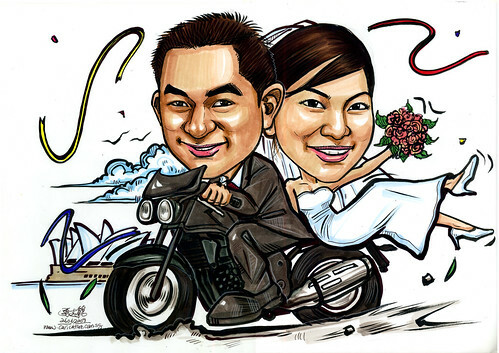 The groom and the bride are riding the motorbike (I attach two of your caricatures that I like to be similar, but the bike is the Triumph one that I sent the photos to you last time, the groom sits like the picture 1 and the bride sits like the picture 2), the background is maybe the church, or the Sydney Opera house (cuz we took wedding photos in Sydney).... we both are in big smiles in the picture. If the photos that I sent to you are not enough, pls let me know, and I will sent more to you :)"
To me, motorbike is always tougher to draw, as compared to car. Besides structurally, to squeeze 2 big heads, and sit close together, it is always never a easy job.